Even though humans and dogs can be best friends, we are very different in the way that we see the world. Apart from the obvious differences (they are furry and they bark instead of talking) the biggest difference is the way we perceive our environments through our senses. Both dogs and humans have a good sense of taste, hearing and touch, but the senses that humans use most are smell and sight – we predominately interpret our world by what we see and dogs interpret things by what they smell. This causes us to have very different outlooks on the world around us. Humans have much larger brains than dogs and yet, the part of the brain that communicates with a dog’s sense of smell is up to forty per cent bigger and more powerful than our own. This means that a dog’s sense of smell can be anywhere between a thousand and a hundred million times more sensitive than a human’s. Dogs can find all the most important information purely through what they smell. This explains why dogs go around sniffing every single tree they pass on a walk. Dogs have been known to sniff our sickness before it is even diagnosable by a doctor. They can pick anything as small as a tiny shift in hormones, to colds, flus and certain kinds of cancer – specifically of the skin, lung and breast in its early stages. In a 2006 study, dogs were found to have an 88 percent success rate at detecting cancer in breath alone. Other illnesses detectable by a dog’s sense of smell includes diabetes, narcolepsy, migraines and mental health disorders. 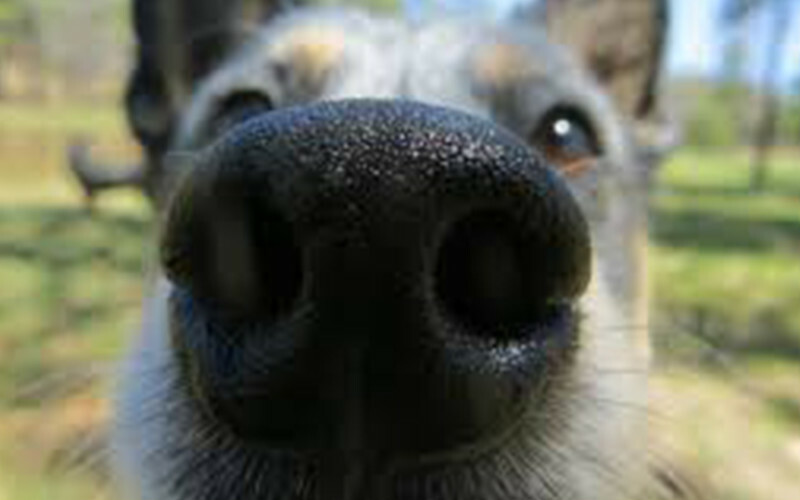 If your dog has a dry nose, it doesn’t necessarily mean that he’s sick. Dry noses are often a result of normal dog activities, such as lying in the sun, digging in the dirt or playing in snow or frost. However, if you see any additional symptoms, you should take your dog to see the vet. If there are no other symptoms, you can take care of your dog’s dry nose at home. Look carefully at your dog’s nose. If there are any lumps, bumps, cracks or discoloration, you should consult your veterinarian. Wash your dog’s nose gently with some warm, soapy water and a clean cloth. Apply a thin layer of petroleum jelly to your dog’s nose. This will moisturize it. Repeat Steps 2 and 3 twice each day until your dog no longer has a dry nose.